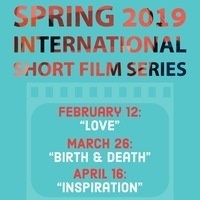 The Keck Center for Language Study presents the Spring 2019 International FIlm Series! Join us for food, friends, and innovative short films from around the world. A year in the life of a cat and his human. Celebrating life and saying “yes” to invitations - despite a language barrier. Two men navigate the painful and poetic end of their love affair. A young Hasidic man in Britain faces the modern temptation of online dating.